View of the house from the garage. 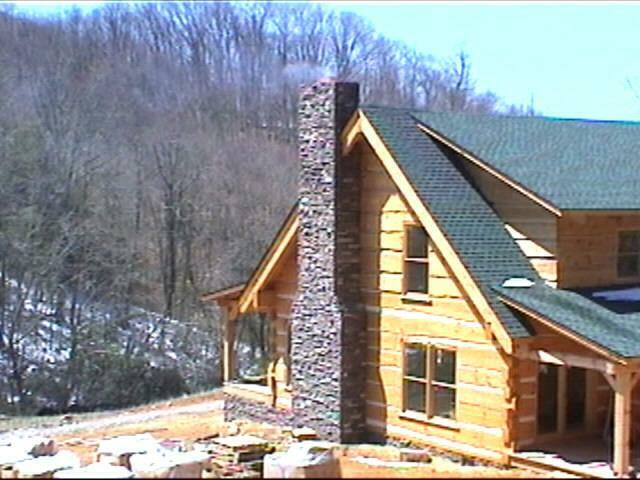 I finally got the stone on the foundation and fireplace done! It was a huge, nerve-wracking undertaking and I'm glad it's over. 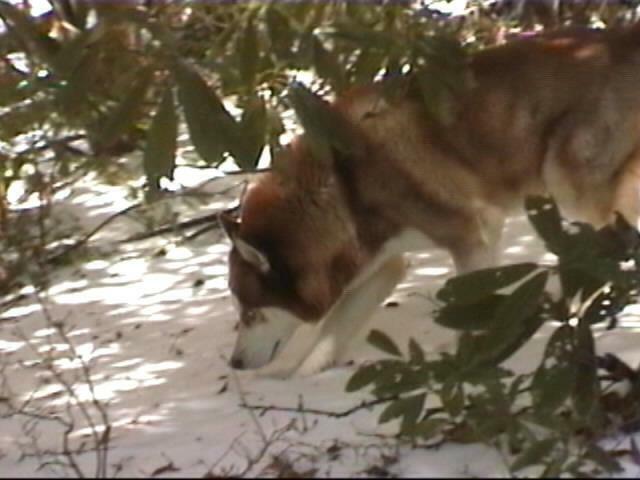 This was the first day I got to film after the rock was on the foundation. Stone laying was delayed a day by snow and bad weather on Tuesday (4/4), but then we had 3 beautiful and warm days to finish before it snowed again Saturday! 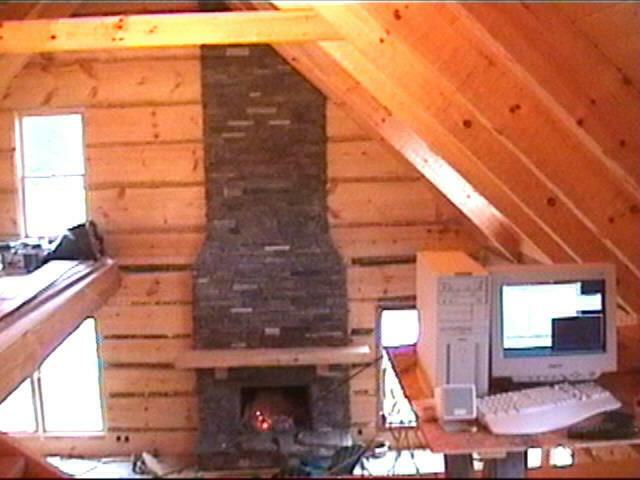 A side view showing the fireplace. The crates in the foreground are the rock for the yet to be built retaining walls. 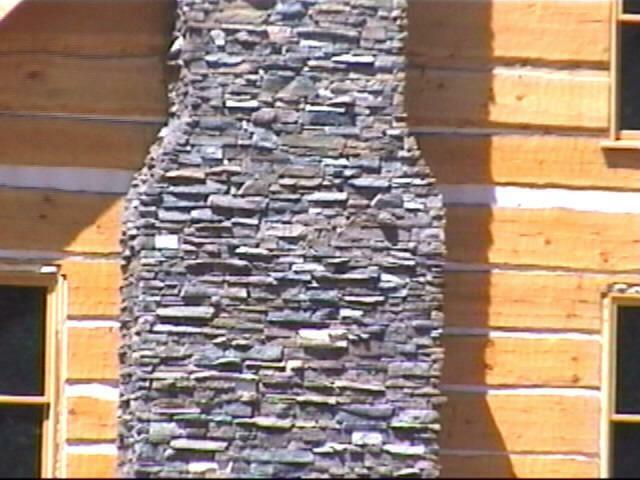 Close up of the fireplace from outside. I'm really happy with the way the rock looks. I took a month to pick it out! It ended up matching the local rock after all. THE GARAGE FINALLY GETS POURED! 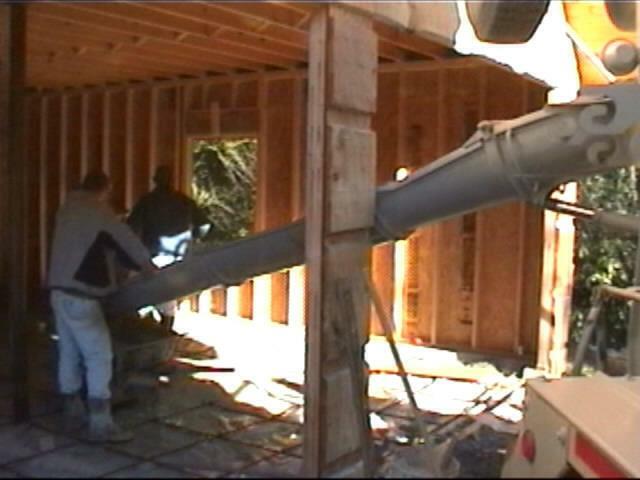 Of course, no one at this time new that the concrete company had delivered retarded concrete, that is to say concrete with a chemical additive to retard drying. They later blamed the mistake on the mixing computer when the truck was loaded, but I think they where afraid the concrete would set before it made it to my house. Jerry, the guy I hired to pour the concrete should have been done by noon, they ended up leaving at 8:00 PM! And even then they didn't get to do as good a job as they usually do and it took 3 days to totally set up! The good news was that the slower the concrete sets, the stronger it is. 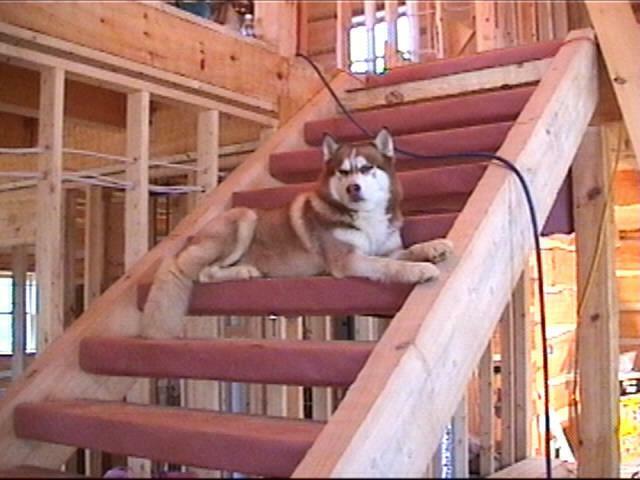 Timber taking a break from one of his favorite spots, half way up the stairs. 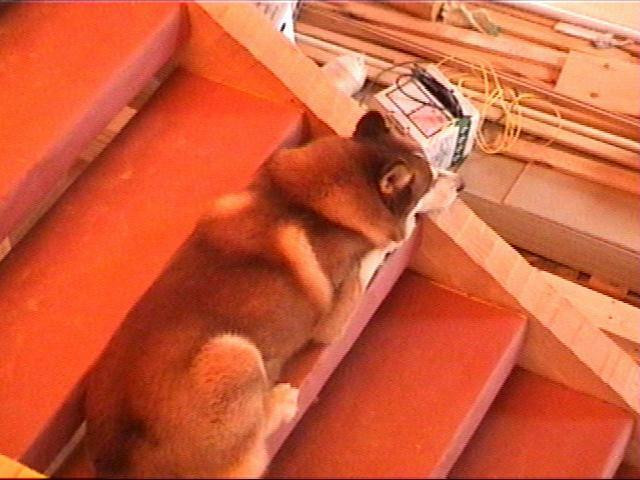 He loves to lay down where he can keep an eye on everything. 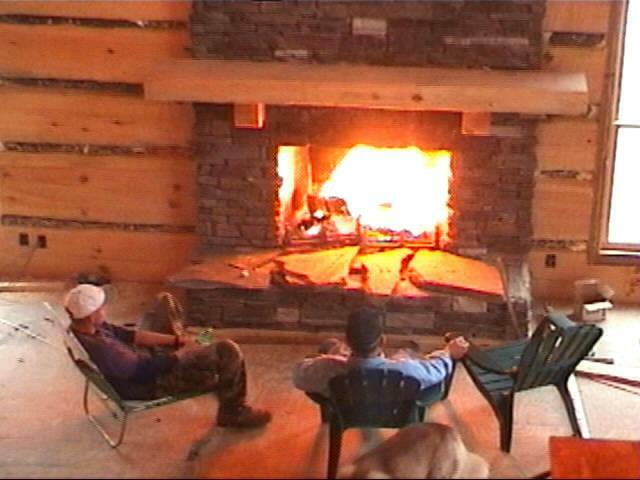 My brother Chris and Dad taking a well deserved break by the fire. We've set many hours in front of this fireplace, and I've not even moved in yet! 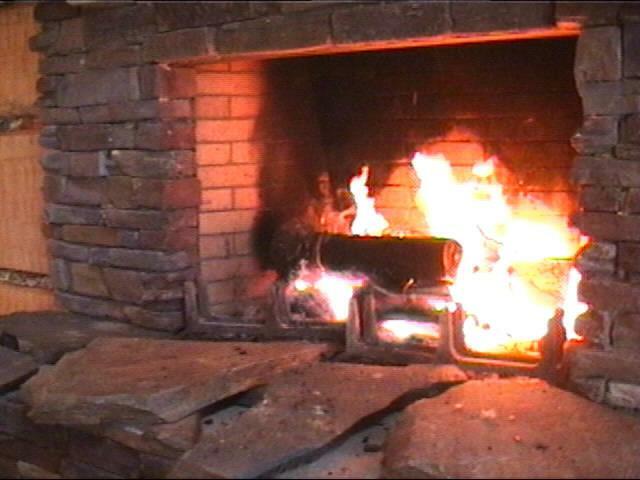 The warm fire is very seductive and once you sit down in front of it, its very easy to sit there for hours. It's hard to get up and leave it. This was a cold and snowy day, and the fire made the house cozy and warm. Here you can see that we haven't yet laid the rock on the hearth yet. A view of the ceiling of the house. This is from my soon to be office looking back towards my bedroom. 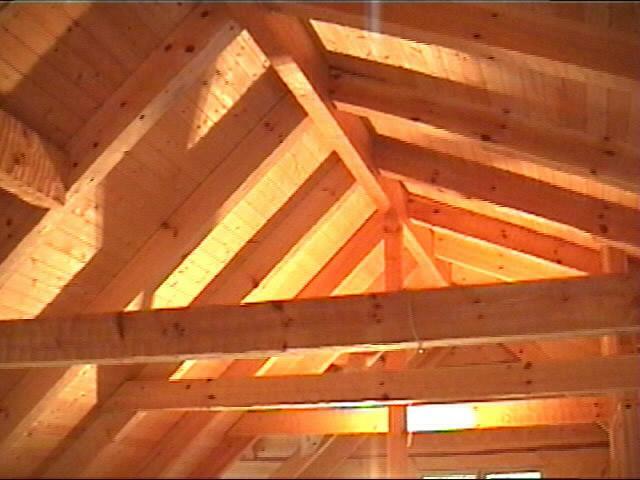 I'll have track lights along the collar beams (the beams running horizontally) to give the house a warm glow. While all the stone laying and concrete pouring was going on, I worked the whole week from my temporary office. This is in my soon to be bedroom. From here I could work, but keep an eye on everything. The house now has two phone lines so I can be on the Internet and still take calls. After not even having cell phone service available, what a luxury! Timber is just about asleep. We've got rosin paper protecting the stair treads until they can get their final coat of polyurethane. Here's a view of the prototype window trim. We built this to try out several styles of trim configuration. I think I've settled on this one. 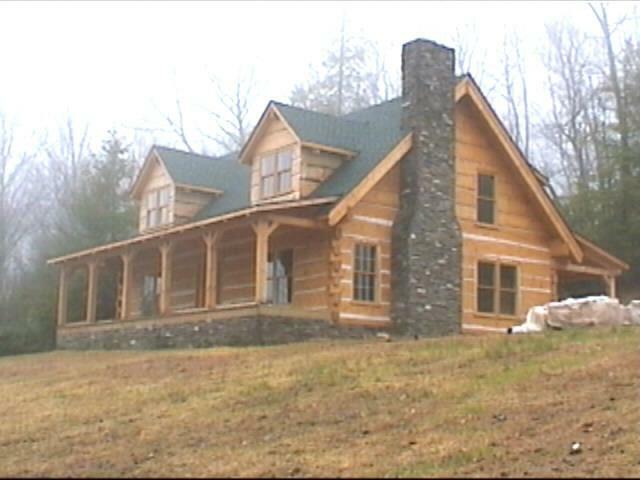 On this one, the top trim overhangs the sides just a little. Timber looking out the living room window. 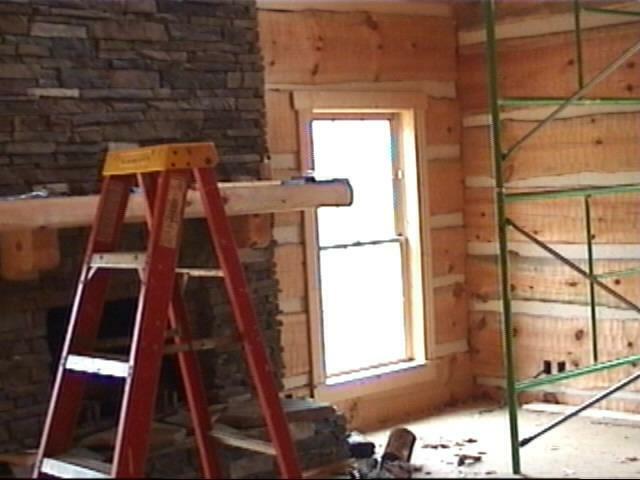 We still have all the window trim inside and out to do. 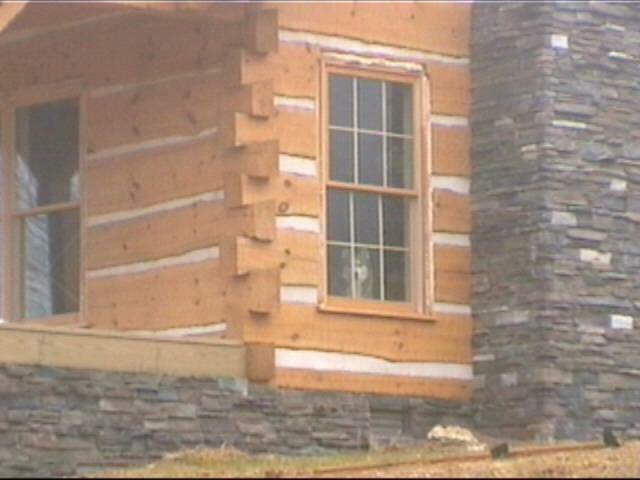 The logs around the window have to be shaved away and evened up so the trim can have a smooth surface when attached. A pretty big job. 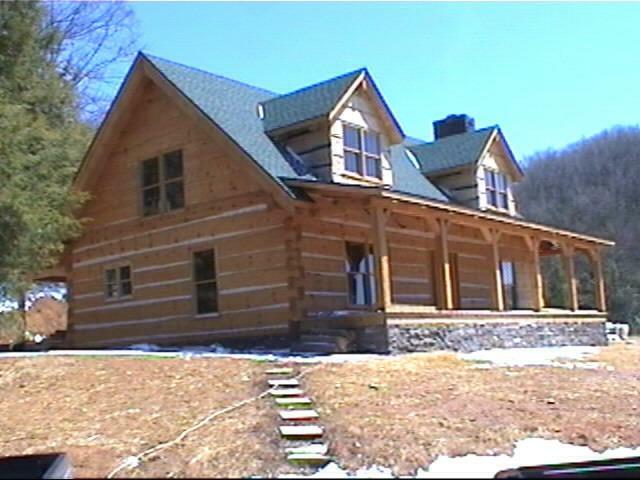 A parting view of the house. Hope to be moving in in a couple of months!